AFC Ajax FROM Japan: January 19 - Ajax vs AZ / Why Did They Lose? A KNVB rematch between Ajax and AZ was played on January 19 and Ajax were eliminated from the tournament after their 2-3 loss. Here's the match report. 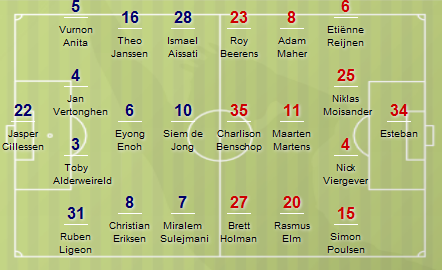 Boerrigter and Van der Wiel were injured and not on the starting lineup. Instead, Ligeon was used at the right back and Aissati played at the left wing. Siem De Jong came back from injury and played as a central forward. Cillessen was the goalkeeper in this match instead of Vermeer. The beginning part of the match was not very bad for Ajax. After 10 minutes from the start, Siem De Jong reacted to the brilliant lofted through pass from Eriksen and shot the ball into the net. But the away side strengthened pressure and started to keep the ball in midfield. The three midfielders of AZ, Elm, Martens and Maher, together with the wingers Holman and Beerens, were all very hardworking throughout the match, and prevented the Ajax midfielders from keeping the ball freely. Of course, their individual passing skills and combination were significant, and while the two Ajax playmakers Janssen and Eriksen were not allowed to play their role, AZ dominated the midfield and made many opportunities directly led to the goal. Ajax defenders lost their balance as Elm and others build attacks, and this led to the goals scored by Martens and Benschop in the first half. However, soon after that, De Jong again put the ball into the goal by kicking a rebound off the goalkeeper. So the first half of the match was not very bad for Ajax. But as they entered the second half, the game was completely dominated by AZ. Although the penalty decision was unfortunate for Ajax, they maintained ball possession. Actually, the statistics shows that Ajax slightly exceeded AZ in ball possession by 52-48%. Ajax did not made many passes among the defenders, and the attackers dribbled well and made many interactions between each other. So what was the matter? Rapid transition from defense to attack is the key concept in modern football. And transitions from attack to defense are also vital to regain possession. When there are skillful and rapid wings are on the pitch, Ajax can also apply this concept. Since the inception of this season, Boerrigter has played a significant role in this regard. His agility and acceleration have been the important part of their counter attacks. Sulejmani, though he doesn't have much durability, can play a similar role. But without Boerrigter on the starting lineup and with the strong AZ left back Simon Poulsen in front of Sulejmani, the team was not able to make rapid counter attacks. And it seemed that the attackers were not very contributing to defense, especially when they lost possession on their own responsibility. Ajax often showed another problem in this match; they slow-downed near the penalty area too many times. They gained possession in the opponents' half with their good passing and dribbling skills, but they couldn't penetrate into the box. The attackers were skillful, of course. Aissati did keep the ball quite often, but the combination between him and other players was rare, and while he was keeping the ball, the defenders of AZ maintained or regained their balance, preventing Ajax from making attacks directly led to the goal. Moreover, the side backs, Anita and Ligeon, partly because they had to deal with the dangerous opponent attackers, were not able to make a over lap run. But I suspect that even if they participated in attacking and made good combination with the attackers, situations would not be very different because they are not very good at crossing. Similarly, Eriksen and Janssen were not allowed to play as creatively as they did usually. And there were other individual problems on the part of the players. Janssen, especially, was not in good form. As mentioned above, Ajax had many injured players. So my conclusion is that it would not be very likely that Ajax won over AZ even if the match were replayed by the same players on another day. 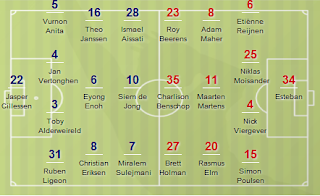 The injured players are expected to come back to the squad in the Eredivisie match against the same team on January 22.